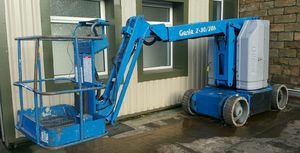 GENIE Z30/20n Cherry Picker Scissor Lift Access platform Safety. Here we have a Genie cherry picker, in great condition and until 5 month ago was regularly maintained. Very low hours of just over 1000, I'm not sure on battery condition and as such the machine is sold as is. Machine was made in 1999 and weighs in at 7.5 tonnes.